Remember that changing a screen of an electronic book is quite a hard work and if you are not sure in your abilities, it is better to go to the service centre. The authors are not responsible for your actions while following the recomendations written in this page. In order to make sure that exactly this model of the screen is installed in your e-book it is necessary to disassemble your device before buying the screen. Some manufacturers of e-books install different displays into different batches of the same model! 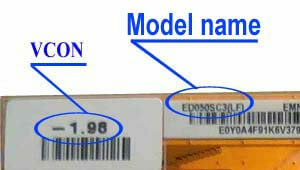 On the flat cable of the display there are pasted some paper labels. There is given the voltage VCON as 3 numbers with a dot after the first number, which is needed for the image correction, on one of them. While on the other label which is bigger there is the model of the screen. There is shown marking area on the display in the picture. Size of the working area of the screen: 91x122 mm. To find these books, check out the "e-library".